It appears things have scaled back a bit (or else I completely missed the kick-off street fair which is totally plausible with the week I had last week), but over 20 venues in North Park will be broadcasting the World Cup games. Obviously hours and locations vary dependent on game times, but you can follow along and make your own schedule by checking out the official website here. There's more information from April in Uptown News. 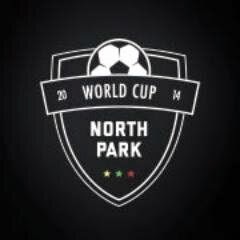 Be sure to hashtag #WCNP2014 as your out and about enjoying the games so fellow soccer lovers (and stalkers) can find you! and Follow/Tag them on Twitter: https://twitter.com/WCNP2014 @WCNP2014 because a few people put in a lot of time to make this sweet possibility happen in our neighborhood. UPDATE (6/12/14): Big news on opening day! With the help of the City of San Diego and North Park Main Street, several business owners in North Park, including Bar Pink, The OfficeBARSD, Caffe Calabria, Coin-Op Game Room, Waypoint Public, West Coast Tavern, Ritual Tavern, Lefty's, Rufskin, Fat Boys, and U-31, have pitched in to close down 30th St. and put a 20' wide jumbotron on the street for the World FIFA World Cup final match on July 13! It will be all-ages and free to the public!